SARA (Satellite Amateur de Radio-Astronomie or Satellite pour Astronomie Radio Amateur) carried a radio astronomy experiment designed to survey radioelectric emissions from Jupiter. SARA measured the radio-waves transmitted by the largest planet in the solar system, Jupiter, at frequencies between 2-15 MHz. These frequencies can not be observed from the Earth, as they are blocked by the ionosphere. An earth orbiting satellite beyond the ionosphere is ideally suited to receive and study these signals. The waves were expected to be strong enough to be received by omni-directional antenna, thus no attitude control was required. 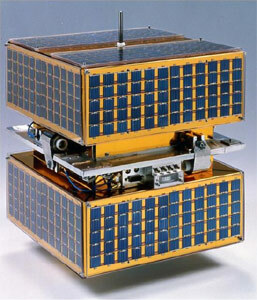 SARA was an 0.45 m cube shaped satellite built by the French Club ESIEESPACE. It featured six 10 m long, deployable antennas. Power was supplied by body mounted solar cells. Shortly before launch it was decided to add two other technological experiments on board. The hardware provides a real time telemetry of the temperature of SARA plus the battery's voltage. The on-board equipment receives radio waves between 2 and 15 MHz and can calculate their average amplitude over 150 seconds which constitutes the useful information. Two of the six antennas are used to transmit the data to the ground station. During its projected 11-year mission, SARA supplemented information gathered by the Ulysses and Galileo spacecraft.